Figure 4.6. TEE short axis image of an aortic dissection. Note the large false lumen (F), small true lumen (T), intimal flap (arrow). Color flow demonstrates flow in the true lumen. Reprinted from J. Invasive Cardiol. 1 (1989), 328-338 with permission from HMP Communications. Figure 4.7. TEE images of an aortic dissection demonstrating the usefulness of multiple views. F = false lumen, T = true lumen. Arrow head pointing to the communication demonstrated by color Doppler. Reprinted from J. Invasive Cardiol. 1 (1989), 328-338 with permission from HMP Communications. and false lumen and thrombus formation. A tear in the intima with out avulsion from the underlying layers will be seen as abrupt discontinuity of the surface. However, the tear may not be obvious in an aorta with atherosclerosis. Image optimization by using edge enhancement and imaging with multiple frequency may be necessary for recognition and differentiating classic dissection from atherosclerotic ulcer. A highly mobile undulating flap indicates free flow between the true and false lumen, reentry into the true lumen, and minimal or no thrombosis of the false lumen. Intimal flap moves toward the false lumen in early to midsystole and toward the true lumen in late systole to early diastole. This is because the major flow is still in the true lumen. Limited systolic mobility of the intimal flap generally indicates that the false lumen is more of a blind pouch or column with no reentrant tear or thrombosis of the false lumen distally. On the other hand, movement of the flap toward the true lumen in early to midsystole and no movement in diastole generally indicate compromised true lumen distally and the major flow is via false lumen. 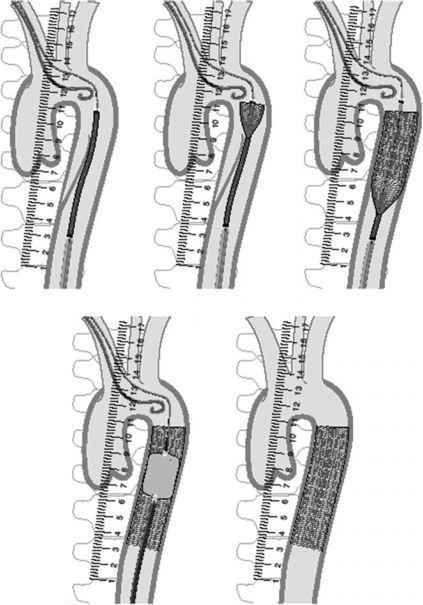 Movement of the flap parallel to the aortic wall is generally seen when the false lumen is thrombosed or when there is a retrograde extension of the dissection either from the arch or from the proximal descending aorta to the ascending aorta. Parallel movement may also be seen with reverberation artifacts. Small inti-mal tears can be missed easily unless multiple views and multiple windows are used. 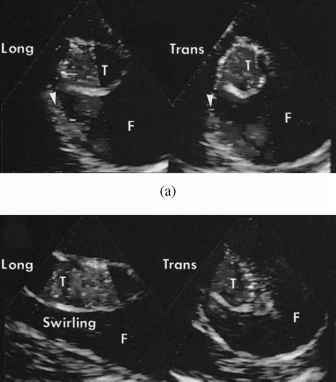 Similarly meticulous incremental views of the aorta should be obtained using a multiplane transducer, imaging the entire segment from short axis to long axis so that all portions are seen. The diagnosis may be missed even with a multiplane transducer in cases involving only a small segment of the distal ascending aorta obstructed by the left main stem bronchus. In dissecting aneurysm with a small intimal avulsion and severely enlarged false lumen11, the dissection may be missed and mistaken for an aneurysm alone. What is an intimal flap in an abdominal aortic aneurysm? Where is intimal flap in the body? Is intimal flap the same as dissection flap?